A number of people suffer from pain in the kidney area, and yet do not know what is wrong. Even though test results may be normal, the pain is undeniably there, sometimes waking us up each morning to visit the bathroom to urinate. My uncle had suffered from lower back pain for so long- he ended up having to take painkillers and now is suffering the side effects of the painkiller. Another family friend is having spondylolysis and the painkillers no longer work. I myself also suffer from lower back pain. These are methods that I have tested on myself and had worked on me- it does not cause money but is painful but effective. When I try to google around and even search in YouTube, I could not find anything near to what I am doing- so I decided to write the entire article myself. Hopefully what helps me can help you as well- if you are willing to try this unusual method. I strongly suggest that you get yourself tested- at least do a blood and urine test to rule out any kidney problems. Even though I’ve written about the possible mind body connection between kidney pain and the negative energy of fear, sometimes I do get a little discomfort in the morning. Through being more aware of my body, I suspect that the discomfort was due to energy or channel blockages in my body. I do strongly believe that invisible energy/ life force/ qi/ chi flows within us- if there is an energy blockage or stagnation, then pain can easily occurr. This is further proven by the fact that at one time, my lower back got even more painful after each wai tan kung session (wai tan kung is similar to qi gong, healing with qi movements). Now, most people may get discouraged or stop qi gong, tai chi or wai tan kung exercises when they notice the pain gets worse after practice. You see, after a few months of consistent practice, my qi flow is developing a little. Qi/ chi is moving more freely within my body. The pain occurred because as the qi/chi moved upwards, the channel on my lower back is stuck. This cause accumulation of stuck qi, thus bringly discomfort and pain. 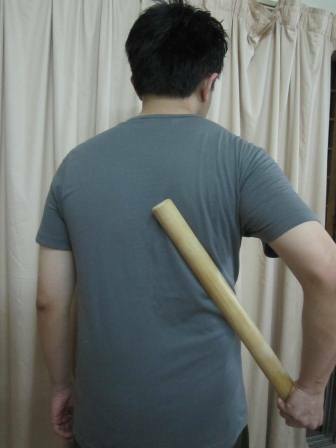 You may not heard of this before- well, by using cane exercise… or just using the cane to beat yourself up. Before you started to mutter to yourself what total garbage this is, I want to let you know that I’ve had this problem, I’ve personally tried it myself and it works for me. 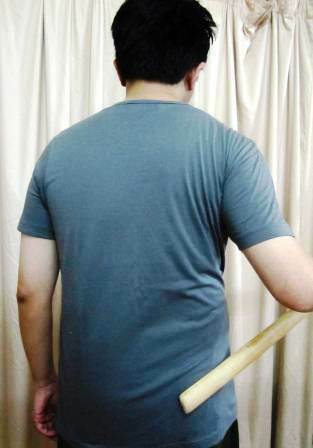 With a cane, as I dispurse the stuck energy around my lower back, the qi/chi gets to move more freely. I feel more energetic and my limbs do not feel so heavy, cold or numb as they may do at times. Disclaimer: The methods below worked for me and I just want to share it after feeling sorry for those around me who suffer from the pain. It is shared with the best of intention. As before, adapt at your own discreation and risk. 1. Get a piece of soft wood- made of something like pine or even a bamboo stick if you can find. Why we do not want solid heavy wood is because you need to carry it and beat in quick movements- not easy if the wood is heavy. Also, soft wood sort of absorb the vibration that comes from the beating. Mine is the stick used specifically in cane exercise. This helps to also disburse stuck energy accumulating at certain points. But if you cannot find the specific cane, the wooden handle of a wooden broomstick would do (of course dismantle it and separate from the dusty broom). Area in pink: The points in pink squares- from lumbar, sacrum to coccyx, even if you apply moderate pressure and just hit “pak pak” sound, you would find the pain sharp. A lot of energy blockages seemed to occur and that becomes obvious with the pain experienced. Go with the intensity what you are comfortable with and do not hit the bone directly- hit around the muscles area. Do not hit hard like what a criminal is hitting a victim. If you get sharp pain or discomfort in the morning that wakes you up the morning, or you usually get chronic lower back discomfort, I guarantee you will feel sharp pain even though you do not beat yourself hard. For myself, I use a bit hard because I already used to it. OK, after you covered those main pink points (again, do not beat the bone directly), you need to beat up surrounding parts to clear the blockages as well. Imagine there is a tunnel and you are clearing off some stuck sludge on one area- if you do not clear the rest of the tunnel, the sludge will end up going somewhere and getting stuck there. That means, you need to beat downwards and upwards to clear the dispersed qi/ energy. After hitting at the buttocks, you may move downwards towards your quads, hamstrings, calves (back, and both inner and outer). And then finally at the upper back where trapezius muscles are (illustrated on the first picture as blue shaped) . 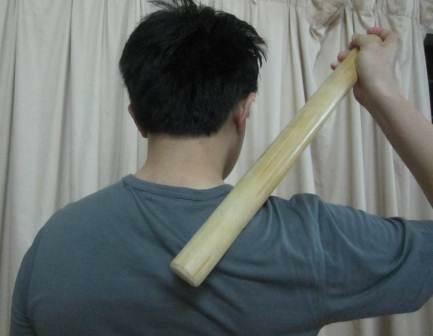 Do NOT hit your neck, or face with the cane/stick. 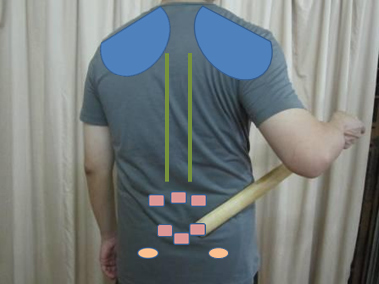 Again, use the stick at area where there are muscles and don’t hit directly at the bone. This is effective even for chronic pain. After doing this, drink a glass of water (as warm as you can) and do not bathe immediately (try to wait at least 30 minutes). You may also perform guasa on these areas separately (but cane beating is effective in dispersing stuck energies to make the channels flow easier again). As we are not health professionals, it is more effective if you render it on your ownself. Because you would know which points are sensitive or felt uncomfortable. Do not ask someone to beat you because ahem, people can report to police if you tell them that the blue black that appears on your body is the result of someone whacking you with a stick. Oh yea, about the bruises, it will go off very fast- unless you have a preexisting skin condition (for example skin crack, bruise very badly, etc) or diabetes. If you do, then you may want to skip this. If you are afraid of pain, then you need to ask yourself whether do you want to risk eating so much painkillers that it weakens and tax your kidneys and liver, OR try something- it may be painful at first but is effective. Hopefully, this would relief you of your lower back and kidney discomfort/ pain. Again, don’t only keep trying home remedies for your pain in kidney area or lower back. Get a simple blood and urine test done to ensure it is not a symptom of a more serious health problem.